it did not recognize the device. bootloader is missing or corrupt. it is like an empty device. how to connect n detect by pc??? Thanks a lot Gsm Xda team. my coolpad dazen 1 went dead after updating it to MIUI 8. Can you help me out?? Device Detected to Computer or Laptop ?, if detected then check driver in device manager there which detected ? COOLPAD X7 BOOTLOOP ..PLS GIVE A SOLUTION....??????? Did you try above procedure ? it always fails at 11%. I charged my phone to 90% but still same, fails at 11%. Should i download the rom again? what to do? the rom which i have is not the one which u provided above. But, i previously used this rom and it worked. brother, i'm not telling this. I'm having this problem and i'm asking for a solution. It always fails at 11%. My battery is charged to 100%. I have tried downloading the ROM again but it didn't helped. Plz tell me what to do? Is there any way to solve the problem. Or the phone will be left as it is :( ? i stuck on 11% issue. please help. Did you try charged battery ? My Mobile stuck on 11% error. Please help!! Yes, It was installed. I am using windows 10. Is that a problem ? hi can u please help i have a dazen 1 its automatically imei number wash and of this the mobile network goen so please help me how can i get back? Which is CPU in your device ? Bro Did u find it the solution for 11% flashing error. what happen ? whats your problems ? I have tried many time but nothing work at all.......i things its because of installing custom rom like miui7 etc. Thanks bro.Me too had installed custom rom.one day stucked up with encryption error and now i am having mount error in TWRP.Planning to install orginal firmware but stuck in 11 percent. bro stops in 11%.any solution arrived?? I am strucking with the phone about the 11% error . But nobody can solve it why. Is there any one who can cotect with COOLPAD company to solve the desire . emmc error .! ! What is this . ? Please provide me the required link where I able to back my dezen 1.. Help Help ..
i can't flash my phone, coz my pc. & the Driver can't install my pc, what to do? 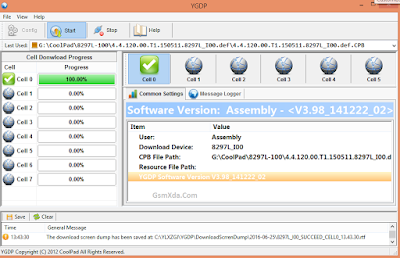 i tried to flash s/w v:4.4.120 and s/w 4.4.150 using ygdp ..
What happen in your mobile ? cool pad dazen hard bricked, when you press power button phone screen shows chinese letters and vibrates for 5mins and then goes off again. I flashed a corrupted recovery. Also hardware not recognised by windows software driver. Please help! did you try this same process ? sir please reply me fast,my ygdp is not detecting my phone,I HAVE SUCESSFULLY INSTALLED DRIVERS ALSO..